Wouldn’t it be cool if we could create personalized Facebook messages with OpenGraph Facebook technology to target certain demographics with anti-smoking messages? We at Team Impact KNOW smoking is a PREVENTABLE issue. In fact, the number one most preventable cause of death is tobacco use in the United States. Each year, close to 450,000 people in our country die due to smoking causes! 45 million people in the United States alone smoke. And secondhand smoke effects close to 88 million nonsmokers each day. Lung disease, heart problems, infections, …we’ve all heard about the stats and the issues. So how can we further make a difference? 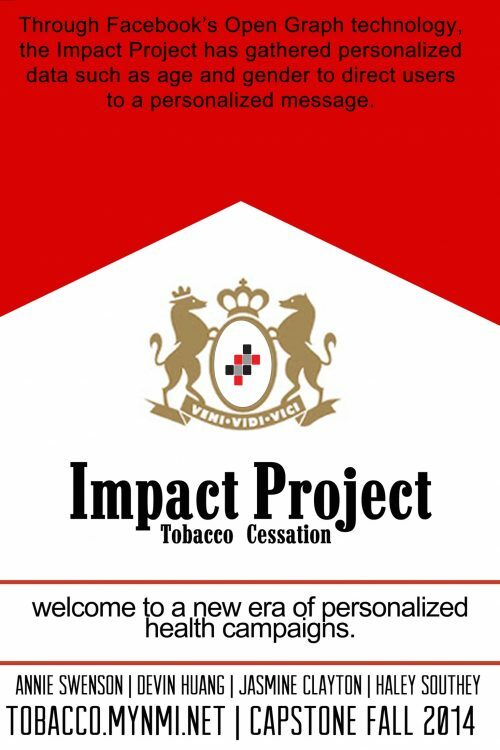 Team Impact’s goal is to relate to tobacco-users on a personal level by using OpenGraph technology to know more about users, and then to create messages directed at the user based on their gender, location, age, and status. This tobacco epidemic CAN be stopped. It IS preventable. And WE can make an impact.